Kern County supervisors had a choice to either allow a question on the November ballot which would ask voters in unincorporated Kern County to raise the sales tax by 1 percent, or risk a severe talent drain from the Sheriff’s Office. At Tuesday’s meeting, the Board of Supervisors chose to keep the possibility of a sales tax increase alive. Supervisors voted 4-0 to direct county counsel to draft the question that could appear on the ballot in November, potentially raising the sales tax in the unincorporated county from 7.25 percent to 8.25 percent. Fifth District Supervisor Leticia Perez was absent from the meeting. 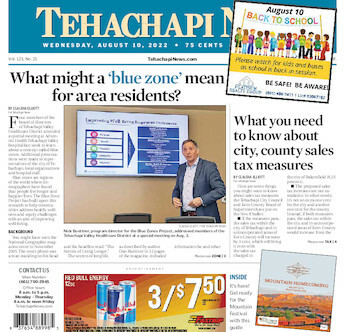 Facing an Aug. 10 deadline, the supervisors have one scheduled meeting left, on July 24, to decide on giving unincorporated county voters the opportunity to raise their sales tax 1 cent for every dollar spent. Kern County Sheriff Donny Youngblood brought the proposal to the supervisors. He said his department needs the funds to bolster the ranks of deputies, which have been depleted after years of lean budgets. Complicating the matter is a measure already approved by the Bakersfield City Council that could result in a 1 percent sales tax increase for city transactions. If passed, the city plans to spend the money partially on public safety measures. Youngblood said at the meeting the city could potentially go on a hiring spree with the sales tax funds, possibly bringing on an additional 50 to 60 officers for the city force. Bakersfield city police are paid more than sheriff’s deputies, and Youngblood worried a large portion of the city’s new recruits could be taken from the Sheriff’s Office if the county did not have the means to offer all employees, from the undersheriff down, a 10 percent to 15 percent raise, which would cost an estimated $10 million to $15 million each year. He also said he wanted to bring in more deputies to fill 50 to 75 vacant positions the department maintains each year. Without additional resources, there might not be enough bodies to staff substations in far-flung parts of the county, increasing response times in areas that already complain of long waits after calls for service. “This is a need that has to be addressed now or we’re going to be several years in rebuilding and recovery,” he said. The tax measure, which would only affect unincorporated county areas and would not overlap with the city’s tax, would bring in an estimated $35 million for the county annually. The funds could only be spent on projects in the unincorporated county areas, and the money from the tax would be collected in the county’s general fund, to be distributed at the supervisors’ discretion. At the meeting, the proposal drew sharp criticism from supervisors, who nevertheless went on to vote in favor of allowing it to move forward. The Bakersfield City Council voted to move forward on a ballot measure after an extensive public outreach campaign, which included presentations to local groups, a survey of local voters, and the provision that an independent oversight committee would watch over the funds. The entire process took months from beginning to end. The county is speeding through its own process in a matter of weeks. The supervisors will have two weeks to digest the proposal before their next scheduled meeting, when county counsel will provide suggested ballot language. The supervisors will need a two-thirds majority vote to bring the measure to the ballot. If it gets to the ballot, only voters in unincorporated Kern County will see the question, and it would be up to them to decide on the increase.